The Metal Commando is back! Arguably the most persistent and dependable band in heavy metal returns with their new album Rulebreaker, available January 29th on Frontiers. There are few bands that have the track record that PRIMAL FEAR has. They have been providing the masses with quality power metal since 1998, and show no signs of slowing down. Rulebreaker is the follow-up to 2014’s Delivering The Black almost exactly two years later. It is yet another entry (the band’s 11th studio album) in a long stretch of excellent releases. There have been some lineup changes since Delivering The Black was released, resulting in possibly the band’s strongest team ever. Drummer Randy Black left the band and was briefly replaced by ANGRA’s Aquiles Priester, who also parted ways with PRIMAL FEAR last year. U.D.O. drummer Francesco Jovino stepped in and really delivered an exceptional performance. Original guitarist Tom Naumann is once again a full-time member, partnering with Magnus Karlsson and Alex Beyrodt. The lineup is rounded out by founders Mat Sinner (bass) and Ralf Scheepers (vocals). “Angels Of Mercy” is yet another superb opening track. “The End Is Near” lays down the gauntlet in pure PRIMAL FEAR fashion. I love the over-the-top scream Ralf adds in the chorus of this track. The JUDAS PRIEST-inspired “Bullets & Tears” follows, and it’s definitely a stand out track. The anthemic title track “Rulebreaker” is straight out of the Mat Sinner songbook. If you are also a SINNER fan, you’ll recognize the style here; it is instantly one of my all-time favorite PRIMAL FEAR songs. The bridge and sing-along chorus should go over well in a live setting. “In Metal We Trust” continues the band’s tradition of songs about the music they love. 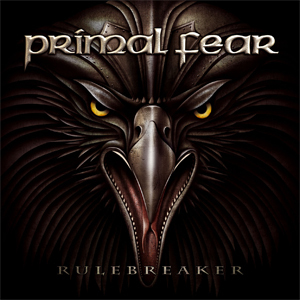 PRIMAL FEAR throws in a twist midway through the album with their longest song ever, a nearly eleven minute epic titled “We Walk Without Fear”. This song is probably the most ambitious thing the band has done since the “Fighting The Darkness” trilogy from New Religion (2007), and features a lengthy intro and an orchestra. “At War With The World” is an excellent track. The ACCEPT-inspired “The Devil In Me” follows. “Constant Heart” is another favorite on the album. The ballad “The Sky Is Burning” follows and the album is rounded out by the blazing track “Raving Mad”, featuring some of Ralf’s biggest vocals. The production was once again handled by Mat Sinner in Hansen Studios, where Jacob Hansen also provided engineering. There are 11 songs, totaling around 52 minutes. The deluxe edition will feature two bonus tracks, and a DVD with promotional videos and a making-of video. PRIMAL FEAR has done it again. Rulebreaker breaks all the rules and is one of their best albums! Pre-order your copy of Rulebreaker in the KNAC.COM More Store right HERE.